How to get the best sound from your CD player | What Hi-Fi? Despite vinyl's strong and continued resurgence, many of us still have CD players. Some of you might be considering buying a new one, so here’s a guide to getting the most from your player and, consequently, your music collection. Before we kick off, remember it’s important to look after your discs. While not as sensitive to surface scratches as vinyl, a compact disc will give you better sound if it’s in good condition. If your disc is a little marked, at best you’ll experience a slightly worse sound, at worst it’ll cause your player to skip or refuse to play the music at all. So handle with care, and always put the disc back in its case rather than leaving it loose. If you’re upgrading or changing your player, it pays to buy the best you can realistically afford. After all, if the maximum information isn't being retrieved from the disc, it's impossible to replace the lost data further down the playback chain. Spending extra money will usually buy you better build and improved sound quality. If you’re buying a new player, consider going for one with digital inputs. These will open up use with other digital sources – computer, set-top box, DAB radio – and will give you improved performance across all feeds thanks to the (hopefully) higher quality digital-to-analogue (DAC) circuitry. Let’s face it - a dedicated audio source is likely to have lavished more care on its DAC circuitry than any product on that list. First things first: make sure you install your player on a proper support to minimise the amount of vibration it has to cope with. Ideally, this would be in the form of an equipment rack. The perfect platform will be rigid, level and low-resonance. While CD players don't show up the effects of vibrations as obviously as, say, turntables, simple things like footfall or even the sound from your speakers - especially at loud volumes - can make the player's data-reading mechanisms work harder, which can affect the sound. Not convinced? A cheap experiment is to put a partially-inflated bicycle inner tube under the player and listen for any difference. Don’t inflate the tube until it’s hard. The trick here is to keep it as soft as possible while still lifting the player’s feet off the support surface. It may be a bit awkward to get the player level, but if you hear improvements then you know this is a course worth taking. If you don’t, hopefully you had a bit of fun in the process. As long as no one was watching. Just about every CD player will come with a pair of analogue connection cables in the box. It's best to consider these hook-ups as no more than a 'get started' measure. Even a budget player will sound better with some good interconnects, so arrange a demo and budget from around £30 for a better pair. Or more, naturally, if your system is of the high-end variety. Most machines have standard phono sockets for their analogue output, but some also have the option of balanced XLRs. These can give better sound quality, but not always. It all depends on how well the balanced circuitry has been designed in both the source and amplifier. Unfortunately, the only way to tell is to try it. In most cases – outside of higher-end products - we’ve found the single-ended approach to perform better, with the balanced option generally just sounding louder. The other, very handy facility you should consider using is an optical or coaxial digital output This allows the player to be connected to an outboard digital-to-analogue converter (DAC). It’s something to consider if you have a player that’s working well but you want to improve the sound. There are plenty of good DACs around, with the Chord Mojo an excellent option at £400. 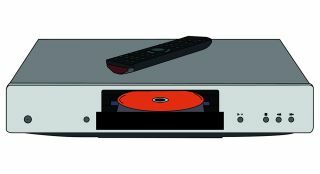 At its simplest, a CD player needs just one button to open and close the drawer, a couple to start and stop playback, and track-skip up/down controls. A headphone socket with its own volume control might come in handy for late-night listening. CD players will come with a remote control as standard. The handset will let you access a range of functions – often including many that aren't available via the fascia buttons – and allow you to pause the music, skip tracks, programme a selection of tracks and so on. If you use an amplifier from the same brand, chances are the remote will 'drive' both amp and player. As well as letting you see which track's playing, some players show artist and title info when playing CDs with CD-Text. Strange as it may seem, it's not unusual for a player to sound better with its display turned off, as the display can create some electrical noise. Perhaps even less obvious is the effect of switching off the digital outputs. This isn’t a particularly common feature – Marantz’s splendid CD6006 UK Edition has it – but it can give a small but notable improvement in clarity and dynamics. You’ll only notice this if the rest of your system is transparent enough, though. We’re seeing far more machines that give the option of changing digital filter parameters. Audiolab is a big fan of this approach on both its CD players and DACs. It’s well worth playing around with these. The default setting will usually be the best measuring filter, but you may well find one of the other options sounds better. It’s well worth taking the time to experiment. We’re less positive about the upsampling option on some players. If the implementation isn’t spot-on you end up with a smoother, more refined sonic presentation, but one where the attack and sparkle in the music have been diluted. Just about any CD player will work with almost any amplifier – at least in electrical terms. Most players’ analogue outputs deliver around 2V, give or take a few microvolts, and that's just what the amp's line inputs expect to receive. If you're using a vintage amp built before the CD age you may have some issues, but a simple modification will sort them out. One final note – a system can only sound as good as its weakest link allows. If the rest of the set-up is unbalanced or poorly set-up, any changes you make at the source end simply won’t be revealed. Once you've got everything set up perfectly, all you need to do is kick back, pop in your favourite album (or try some of our recommended tracks for testing systems) and enjoy.